For restaurants that allow smoking in their dining areas, these top quality ashtrays are durable and easy to wash for your restaurant. The plastic or glass ash trays are perfect for casinos and bars where smoking is allowed. Libbey Nob Hill Glass Ashtray - 4 in. Tablecraft Round Safety Ashtray Black - 7 in. 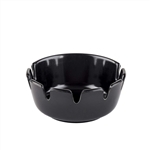 Tablecraft Plastic Ashtray Black - 4.25 in. Glass and Plastic ashtrays for your restaurant outdoor tabletops. Don't overlook this critical restaurant product or your patrons will ash on the floor.